New York City, September 20, 2017- The National Arts Club presents an exciting lecture and demonstration performance The New Era : Ballet + Technology with rising choreographer and Artistic Director of Arch Contemporary Ballet, Sheena Annalise on Thursday, September 28th at 8pm. Sheena Annalise has been recognized to keep ballet evolving with new choreography, new music, and new ideas about advancing ballet into 21st century culture. Her series will explore the expanding use of technology as a creative tool in one of her latest ballets. Replica is a collaboration commissioning 3D-printed costumes by Israeli designer Merve Oztemel and, the creation of a 4D illusion by projecting 3D motion capture on stage in real time. 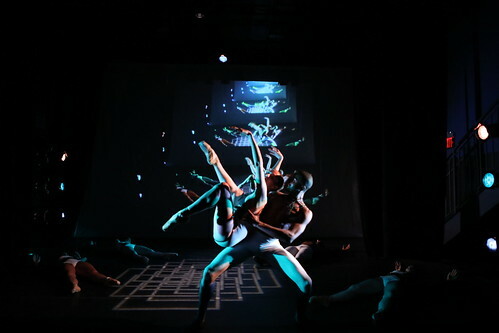 The pros and cons of using technology as a basis for new forms of choreography, using technology to innovate an art form rooted in tradition, and the ins and outs of collaborating with technology artists will be discussed. A wine and cheese reception will follow where audience may meet our speaker and demonstrating dancers. The National Arts Club is a members only club who’s mission is to stimulate, foster and promote public interest in the arts and educate the American people in fine arts. Our lecture and demonstration is free and open to the entire public, attendees must RSVP in advance. The clubs dress code requires men in suit jackets and women in dresses, suits, or clothing of equivalent formality. No denim, tank tops, or crop tops. The National Arts Club is located at 15 Gramercy Park South, New York City. Accessible by subway 6 train at 23rd Street and the 4 5 6 N R Q trains to Union Square. The National Arts Club was founded in 1898 by author and poet Charles De Kay, the literary and art critic for The New York Times. He together with a group of distinguished artists and patrons conceived of a gathering place to welcome artists of all genres as well as art lovers and patrons. At the turn of the 20th century American artists began to look to our own country rather than to Europe for inspiration, and the American art world was alive with energy. The newly-formed National Arts Club took residence in a mansion on 34th Street. American art had a new home. Our mission is to stimulate, foster and promote public interest in the arts and educate the American people in the fine arts. Artistic Director and choreographer, Sheena Annalise, at age 14, was honored to work with Wayne McGregor | Random Dance in “Equator Project”, nurturing her choreographic talent. She quickly found a distinct voice by creating innovative body lines and exploring her fascination with the connection between movement and music. In her early work she began to play with creating her own tempos, accents, and pauses in her ballets without the limitations of existing music. Looking to accentuate her silent yet rhythmic choreography, she developed her artistic process of commissioning artists to create music specifically to each repertoire program. Annalise spent 2012 mentoring with the Mark Morris Dance Group, when she then founded Arch Contemporary Ballet the following year. Through ACB she has received residencies and space grants throughout NYC and has been named a “Prodigy” by The Women’s Project. Merve Oztemel is an Istanbul native; she pursued Textile and Fashion Design at Marmara University Faculty of Fine Arts. Her brand Merve Oztemel is based on the technique of blending craftsmanship with digital technology. Her views of 3D technology and the integration into everyday life have been noted to be “ahead of the curve”, and she implies that 3D technology is the future to creating a unique result in the material world. Founded in 2013, New York City’s Arch Contemporary Ballet was established with a bold spirit and innovative vision to create an artistic process that enhances the connection between ballet and music. All of ACB’s works are choreographed and completed in silence. Commissioned artists then create original music scores specifically for each repertoire program. In addition to her innovative way of joining movement and music, Artistic Director and choreographer, Sheena Annalise, challenges classicism with a cutting-edge approach to partnering, pairing women on pointe together as partners. ACB has performed across the country including the Paramount Theatre in Boston, Tempe Center for the Arts in Tempe, AZ, Marlene Boll Theatre in Detroit, New York City’s Sheen Center, and more. Learn more at www.archballet.com.